An asphalt scar in Rochester, New York, has triumphed over 15 of the world’s worst parking craters to become the Parking Madness 2014 champion. It was a surprising run. Who would have guessed a couple of weeks ago that this scrappy upstart would prevail over some of the sprawliest, most highway-marred urban spaces in North America? 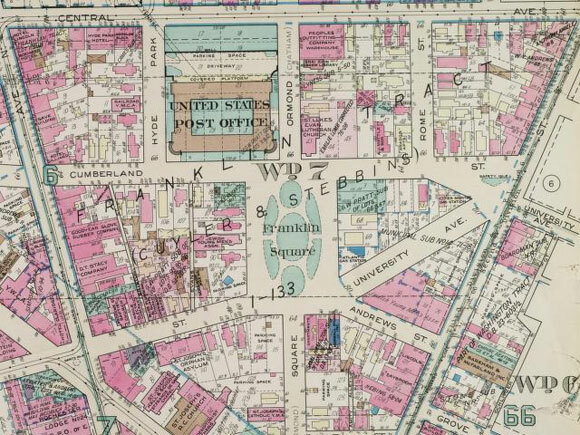 But a devout group of locals, recognizing the advocacy potential, helped push Rochester past Miami, and then Detroit, and then Kansas City, and finally Jacksonville, all the way to the Golden Crater. Quite the Cinderella story. When we closed voting at 2 p.m. Eastern time today, Rochester was several lengths ahead of Jacksonville, leading 611 to 165. 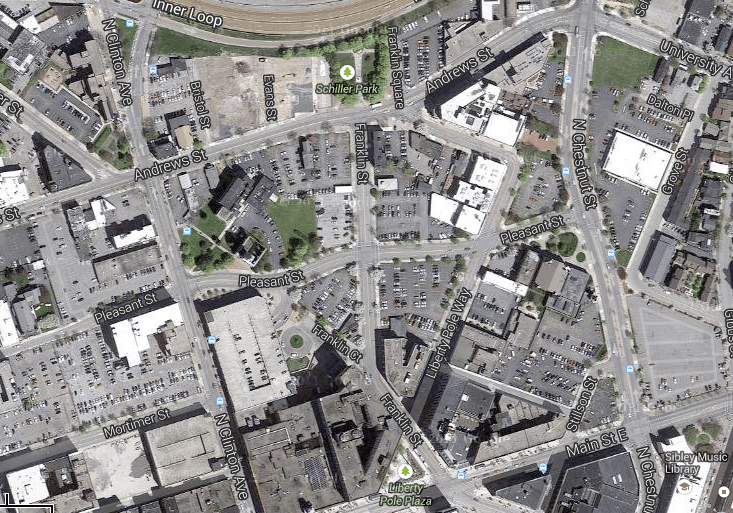 The Rochester parking crater joins last year’s winner, downtown Tulsa, in the annals of Parking Madness infamy. Matthew Denker, the Rochester expat who submitted this entry, said the winning site stood out to him for a couple of reasons. Mike Governale, who writes at Rochester Subway and leads the local advocacy group Reconnect Rochester, rallied the local troops to vote for their hometown crater. Governale pins the blame for this eyesore not so much on city officials, but on the lack of coordinated regional action to promote a healthy city. Most people opt for driving because it’s relatively easy compared to the local transit system, and parking is cheap, he said. Two mayoral administrations ago, he said, a detailed plan was produced to develop a downtown circulator bus system, but it has been sitting on a shelf collecting dust. 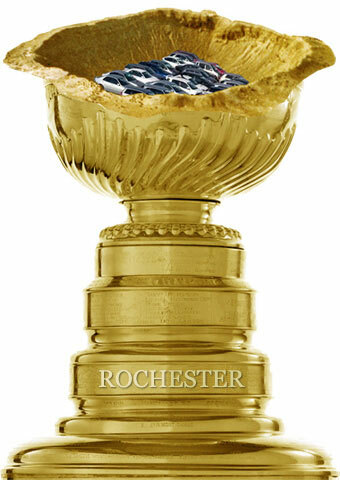 Congratulations to Rochester. Well deserved. I hope I can get up to Rochester for the award ceremony. LOL! If you do go up, just make sure you take the train or bus. I’ve heard it’s impossible to find parking! This remains an excellent photo, and I regret not taking it and adjusting it as an overlay to the current aerial photo. It’s something I intend to do in the near future. Thank you. I’d like to advocate for alternative modes of transportation to Rochester (I frequently take the train from NYC), but it’s hard to argue with how easy it is to drive and park there. Hopefully we can change that a little (or make it just as easy to park for notably less cars). To all the Rochester supporters, thank you. To all the other cities, your parking craters are also terribad, and I really hope that they can all be filled in quickly. Cities exist for people, not as Automobile Daycares. It’s time for a change, everyone. Let’s make it together. The comparison between this and the above is sad. Yikes. So sad for Rochester. Unfortunately it’s not a story unique to Rochester either. 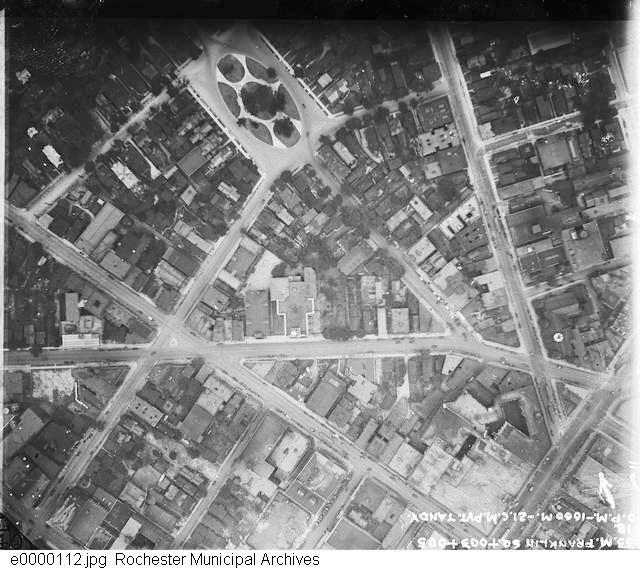 Most of my extended family grew up in the Rochester area, but they all got out and moved to cities with better accessibility and transit once they had the opportunity, even though a couple of them were working for Kodak at the time. Having no urban life and no transportation options will make you reconsider even the best job ever. Congrats/regrets to Rochester, indeed. For next year’s contest, here is a suggestion: let the actual NCAA schools in the tournament compete for campus parking crater awards. I’d guess most would be as competitive as their host cities, alas. There is still a relentless demand for cheap or free, abundant, convenient parking at most schools. Bigger universities are small cities unto themselves, too. Here’s to the Flower City!!! Just make sure you rent a Hummer to get there, Clarence…. Back in 1983, I drove from Long Island to Rochester and left my car with a friend doing his Ph.D. at U of R (mathematics) as theirs was dead. They dropped me off in Buffalo to visit family and had the use of my car for a few days. I rode my bicycle back to Rochester (NY 33 to 33A to 204 into 19th Ward) to their house. It was actually pretty undramatic. Wonder if it still would be so undramatic. Back then, bicycling was no big deal. I agree Jeff. Would we call this progress?? Angie, I LOVE parking madness! When I was in Grad School at Florida State, one of my running complaints was that the school kept building parking garages without charging a premium for parking spaces for drivers. Even Brockport recognized that parking was a commodity with a value, instead of a god given right for students. One needs to have perspective. One should also take into account Highland Park. I say this not to minimize this particular parking mishap, but because people who are unfamiliar with Rochester may be misled to believe that it is not a fantastic little city with perhaps the world’s best park. OK, I love Lilac Sunday so I’m biased. Nonetheless, we have fine old residential neighborhoods with some great associations. But for the endless gray skies all winter long, and I do mean long, Rochester could be the best place in America. But if we had great weather, then people would flock here and destroy what we have.